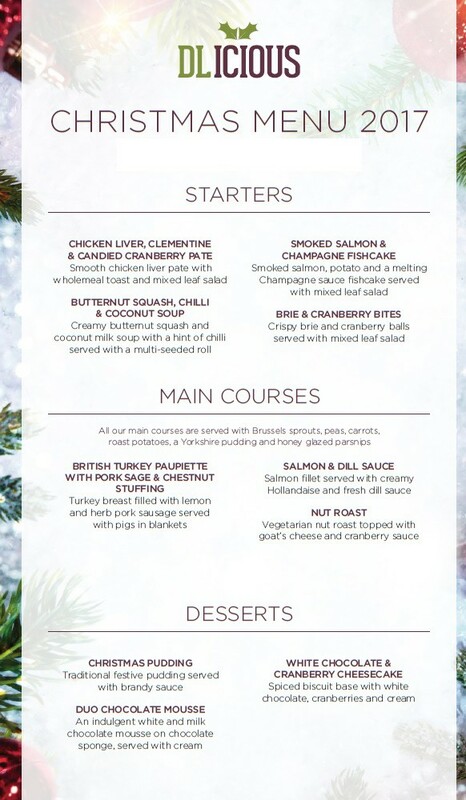 The Redway Runner Christmas meal is booked for Friday 1 December at David Lloyd, arrival 7pm for free drink on arrival (wine or soft drink). The usual merriment will ensue, with a late bar and a disco. If you want to come along after the meal your are welcome at £3.00 per person, please pre-book as spaces are limited to 50. 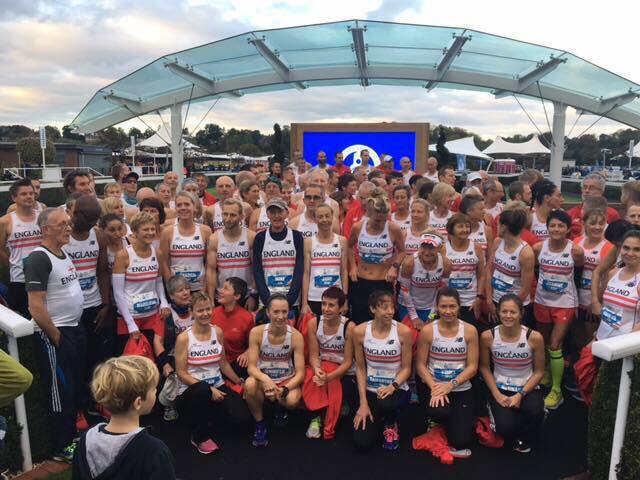 After winning the England Athletics East ‘Running Club of the Year 2017’, Redway Runners have been awarded Highly Commended in the Women’s Running Magazine Running ‘Club of the Year 2917’ awards and came runners up in the England Athletics ‘Club of the Year 2017’ awards. On Saturday 14 October Carol and I had the immense privilege to represent the Redway Runners at the England Athletics Awards and Hall of Fame event. 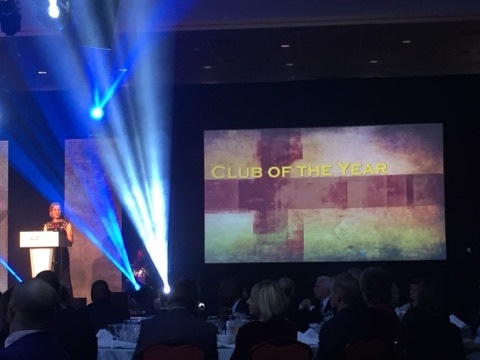 We had been shortlisted for Club of the Year. The honor was huge and even though we didn’t win, to get runner up was a massive achievement for all involved. Throughout the evening we were able to talk to a wide variety of people, all who were from different clubs and sporting associations, and one who was the daughter of a hall of fame inductee, about who we were and what our club did. What seemed to impress people the most was the sheer amount of members and variety we had within our club. 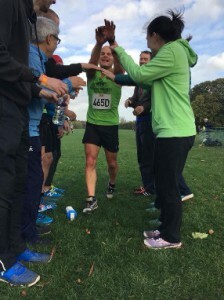 It was great to be able to point people in the direction of our Facebook page and website so they couldn’t believe how much we offered to our runners and the praise and compliments that followed were overwhelming – it really did show us that our club is something truly special. The Redway Runners is an all-inclusive running club in Milton Keynes, with over 1000 members and sessions every day of the week. 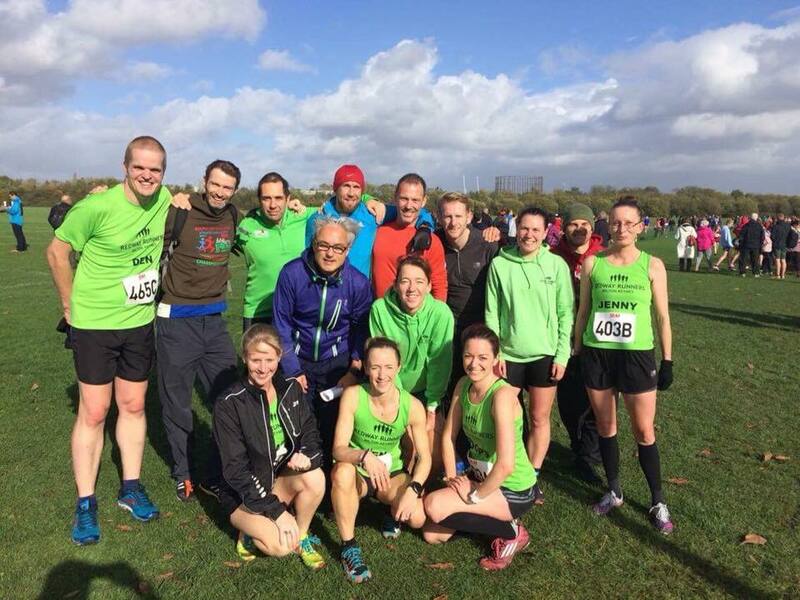 The club regularly runs beginners courses and encourages runners of all abilities to take part. 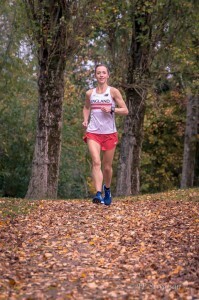 For more information about the club, visit www.redwayrunners.com. Redway Runners will again be putting on a coach to ease your marathon day worries. The coach will follow the same successful format as previous years. Departing David Lloyd on Sunday 22 April 2018 at 6am then gathering us from Leicester Square at 18.00. This year the coach will come at a reduced rate of £18 per seat. Both of these must be done to confirm your seat. If you are not in London Marathon, see below if you want to be in the club ballot, the last date for entries to the club ballot is 20 November and the draw will be at the clubs Christmas meal and party on the 1 December. If you are in let Simon Richards know so you can be added to the ‘Who is Racing where’ page on the club web site. 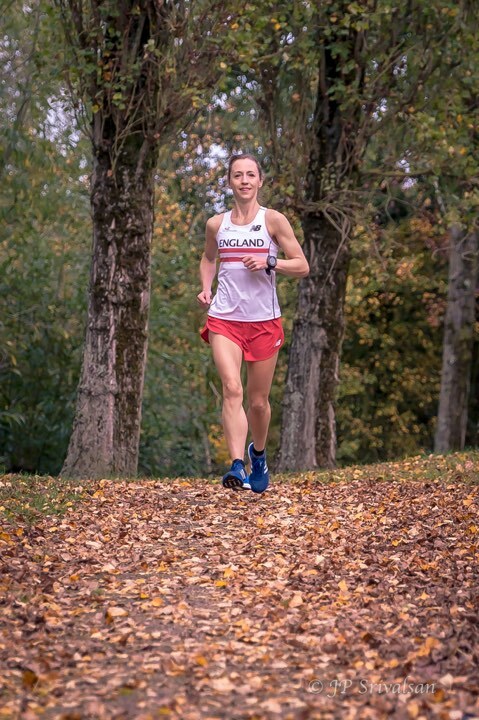 We have a race report from Neville Rowles from the South East of England Cross Country relays. Redway Runners didn’t win it but we got there and did well and were the first team from Bucks!! A brave band of merry men and women met at the Ship Ashore in WIllen to prepare to embrace hurricane Brian in full force for the Southern Area cross country relays. A trip down to the smoke ensued with a visit to the Linford Christie Stadium and Wormwood scrubs!! Thankfully most attendees had a clear record and the only ‘time’ they would be doing would be the race around the field taking on the ups,downs and mud familiar to those who undertake the lovely art of cross country !! We registered and collected our numbers and grabbed a map to take a gentle jog around the course. It soon became clear that this was a course with a difference as it was lacking the usual hills and undulations and had plenty of flat and fast bits but had the usual mud!! The ladies had 3 x 3km and the men had 4 x 5k, with pretty much all of the team members being Marathon or Ultra Marathon competitors , the short distances would be barely a warm up but would certainly shake a few cobwebs from the legs !!. The course started with a gentle uphill directly into the wind before launching left towards the prison and skirting the walls, we then sought shelter from the wind in the trees and passed a beautiful crescent of housing before coming across a muddy and slippery trail on the edge of an industrial estate. At this point the men were sent off in search of more wind and heathland to round some trees and a rugby pitch and battle with the elements on the return journey. The course then re-joined the ladies route and a gentle and relaxing amble through the woods ensued where shelter was provided and footing was secure, before we knew it we were out of the woods and running in gaps between the trees and in the full force of Brian before a sharp right took us slightly uphill and into the full force of the wind to the handover area. 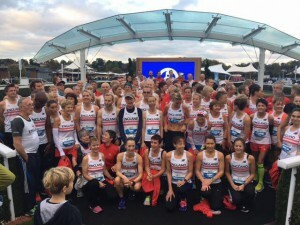 The ladies teams warmed up and went to the start line with Captain Coops and Jen Sangster leading the two teams off for their 3k sprint. Both runners did a stunning job with Jen handing over to Julie Martin and Captain Coops to Jenny Dowling, returning runners looking exhausted but outgoing runners looking nervous, the wind continued to blow but the sun shone and it wasn’t long before the second leg runners returned sending Sarah Jane Bird out for team one and Jenny Moorhouse out for team two. Whilst this was all happening, the lead runners for the men gathered in the pen, Nev and Aidy were somewhat nervous as, just like the ladies, we were probably 20 years older than the average age !! Before we knew it we were called to the line and the gun sounded and off we trotted, like a fool, I went off like a bullet trying to ‘keep up with the faster boys’… shortly after Aidy passed me with the encouraging words of ‘you’re second from last’ !! There was life in the old dog and the stubborn git tried to hang onto Aidys coat tails for all of 50 meters before realising that it wasn’t going to happen today!! Aidy handed over to the competent hands of JD and I crawled into the finish area desperately passing the baton to Martyn Douglas. JD held his own and Martyn managed to right some of my early pacing errors and gained us a place or two before they launched Simon and Denis respectively into the force of Brian, both runners competed exceptionally well and held their positions and by now, just like the ladies race, the field was somewhat spread out before the final runners set off, for team one, Dan Hippey took the lead and sped off into the bleak landscape and before we knew it , grumpy Al was sent to do his bit. All runners returned unharmed and uninjured except for Simon who still had a hangover from the beer festival the night before!! The strategic parking at the ship ashore allowed for some post event review and the great news is that 1. We were there and we completed it. 2. The opposition were all very serious and very young 3. The national champs were actually easier as there was a more varied age group and less of the ‘bigger boys and girls’ 3. We had a fantastic time competing at a very high level and did the club proud 4. We were the only team from Buckinghamshire who actually turned up and can therefore declare that we are the Bucks winners !! 5. We had team members who had never competed at this type of event and they were absolutely buzzing and loved it. Well done to everyone who came along, gave of their time and congratulations to you all, you did Redway runners proud with the guts, determination and bloody mindedness to get the job done. Mens results from 185 runners completing the course we were : 96th Dan Hippey in 16.21 , 106th Aidy Maidment in 16.32, 126th James Down in 17.00 , 140th Simon Read in 17.17, 157th Martyn Douglas in 18.02, 163rd Nev Rowles in 18.13, 175th Al Humphries in 19.00, 181st Dennis Verhoeven in 20.08. 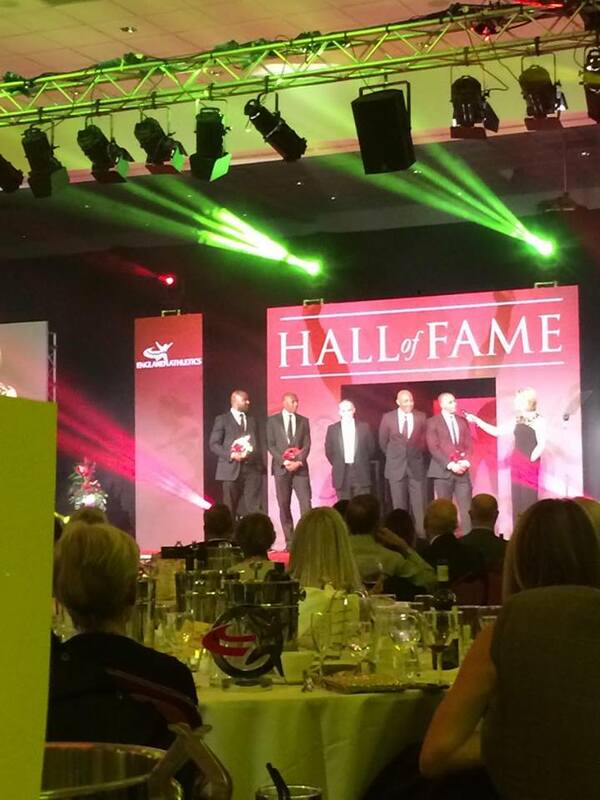 The honour was huge and even though we didn’t win, to get runner up was a massive achievement for all involved. Throughout the evening we were able to talk to a wide variety of people, all who were from different clubs and sporting associations, and one who was the daughter of a hall of fame inductee, about who we were and what our club did. What seemed to impress people the most was the sheer amount of members and variety we had within our club. It was great to be able to point people in the direction of our Facebook page and website so they They couldn’t believe how much we offered to our runners and the praise and compliments that followed were overwhelming – it really did show us that our club is something truly special. 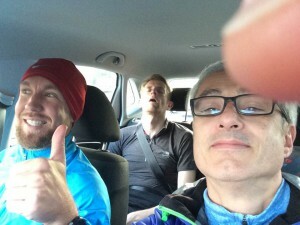 After many month of planning and much cajoling, Sunday morning arrived and the merry gang met at a deserted carpark in Tongwell at 10am to venture down to the Big Smoke to mix it with the bigger boys and girls of the running world. Representing Redway runners in the ladies’ team were Julie Martin, Sarah Buck, Abi Gooch and Katie ‘Clean Coach’ Tucker, the senior men’s were Genci Pepaj, Andy Peak, Dan Hippey, James Down, Andrew Dodds and Ben Fairhall, the Vets team (those who should know better) were led out by Adrian Maidment, followed by Paul Clifford Jones, Neville Rowles and then Genci Pepaj. Spirits were high as we boarded the fun bus in the sun and prepared for the trek down the M1 to Crystal Palace, unfortunately we were ‘one down’ due to injury and debate ensued as to who would ‘take one for the team’ and do a double session. The debate didn’t last long as despite putting my hand up to have a go, I was ousted from volunteering by the very fast Genci and happily let him step into the fold of a double trip on the pain train !! We were also rather nervous at this point as two members of the team were making their own way, one because he had been visiting friends in London the night before (Ben) and one because he was struggling to return from holiday courtesy of the Ryan Air rescheduling challenges (Andrew)… the fear amongst the senior men’s team could be both felt and smelt as they worried who may have to step into the breach and do a double !! After a painless if slow journey down and the usual stop for coffee we arrived at the once grand Crystal Palace and prepared ourselves for the racing. We sought out numbers and prepared our teams for the onslaught by calmly finding seats in the stand and having a general chit chat !! Nerves were clearly showing in different ways as we looked at the activities going on around us. There were lots of people hanging around and some (most ) of them looked very fast. 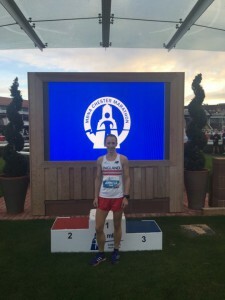 Soon the ladies were called to the start line and after a brief interlude, Abi was launched into the fray and set off around the track and out of the stadium, cantering off on the alleged 4500 meter course. Apparently it was a trek up the hill , a little loop then across the flat and back down the hill and into the stadium for a lap of the track for the handover. Before we knew it the leaders appeared, closely chased by a red faced Abi completing her leg in 15.27 who handed over to Sarah, it wasn’t long before Sarah too was back, again red faced and sweaty in 16.42 who handed over to Jules, completing a much shorter event than usual, by now the leaders were chasing around in what can only be described as ridiculous speeds and were starting their final legs, I began my warm up outside of the stadium, so missed Jules coming in but was passed shortly by the fantastic ‘Clean Coach Katie’ as she shot off up the hill. Checking the results, Jules finished in 16.09 and Clean Coach did exactly as the last leg runner should do and did the fastest leg in 15.05. An amazing result from the ladies finishing 56th out of 82 teams and only just being pipped by local rivals Marshal Milton Keynes. Now that the ladies had done their graft it was time for the men to step up to the plate and do our shift, we had a slightly different course, allegedly 6,000 meters and was two big laps of the circuit. We had split into two teams for the events, one over 40s team and one Senior men’s team, thankfully, yours truly was in the over 40s which gave me an excuse to be able to run slower!! The course was a fascinating one for us all as we shot off around the track and out of the stadium along a lovely flat road and, as most would agree, probably did the first half mile way too fast as adrenalin and nerves took over. Worry not, there was a hill, a steep one through the trees that took the speed from the legs and slowed us right down to a more realistic pace, just as one crested the hill and the slope eased we realised that it was an optical illusion akin to the old watering hole in the desert as it kept on going up but just at a more gentle pace, we then proceeded to run along a flat bit at the top of the park before coming back down the hill in a less scenic part of the park and were teased with the stadium before being sent off to do it all again !! The senior men came in at 65th out of 91 with the times as Genci 16.16, Andy P at 18.44, Dan at 18.59 , JD at 19.04, Andy D at 18.44 and Ben at 16.45. An absolutely cracking result all told. The vets did an amazing job with Aidy finishing in 19.01, Paul CJ at 18.59 and Nev at 19.39. Unfortunately the SEAAA were unable to sort their timing process out and somehow Gencis time was not recorded so we were left as an incomplete so finishing 29th from 30 teams but Gencis watch time would have got us to 15th which would have been fabulous. SEAAA have yet to respond for their incompetence!! We sat and watched the rest of the seniors race taking place and cheered on Ben and Andy whilst gorging ourselves on ice-cream and watching as Genci proceeded to run around and around just to get his mileage up!! It was lovely to see my family and so many people from the club there both running and supporting and I needed the hugs to calm me down but once the horn went, I was off and feeling good. Well, it was an interesting marathon. I went off too fast but I was feeling good so spur of the moment decision was to try something new and see how long I could keep the pace and hold it for. 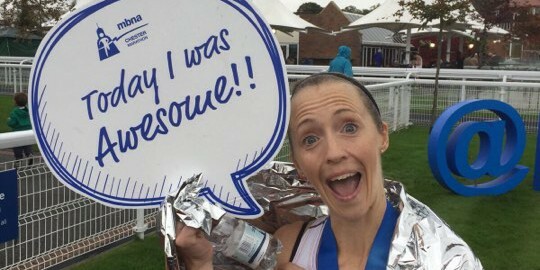 Not sure how good this was on a new course and when running for England but hey, that’s just me! 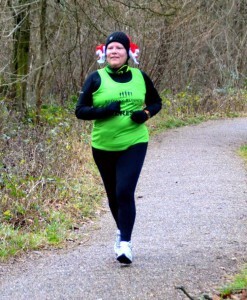 At half way I had a half marathon PB under my belt but by 18 miles I was starting to struggle. The rest of the run was just one foot in front of the other and trying to shake off the jelly legs. The thought of everyone’s support at the club and the messages I knew would be going on Facebook drive me on. The last 3 miles consisted of me chanting “come on Jen, come on Jen” over and over again and trying to stop my head dropping back and closing my eyes (what I do when I’m exhausted). I didn’t even acknowledge Tim and Gillian at 1.5 miles from the end and don’t quite know how I crossed the line on my feet. The last 500 metres was on energy sapping grass – jelly legs is a huge understatement! But I did it – 3.03.09 – a 2 min PB and 5th in my age group! Lessons learnt but every run is different and that’s what makes it such a special sport. You are constantly learning about yourself. Training the brain and believing in yourself is just as important as getting the miles in. Bring on New York in 4 weeks time! On the 11 March 2015 I decided to start running. It all came about because my youngest Son (Justin) kept on at me to do something to keep fit and he said running was a good way to do it. I was 57 and yet to be convinced. All my life I had avoided anything that involved exercise. I enjoyed Tennis and Netball at school but never saw the fun in running around the playing field getting wet and cold. I preferred to be in the gym, hanging upside down on the exercise bar! I’ve joined a few gym’s over the years, but as soon as the novelty wore off I’d be bored. So, I challenged Justin to help me start running, he flatly refused. Right then, I thought, I’ll show you, I’ll do it myself. With the help of my oldest Son (Jason) and the encouragement of my Brother (Steve), I took the plunge and downloaded the NHS Couch to 5K app and did my first ‘run’ to see how I got on. I did about 3K and it took me 35 minutes. I was out of breath, my wobbly bits wobbled a bit too much for my liking and I ached all over once I got home. I did two more ‘runs’ then I went on Holiday for a week. Walking round New York for five days and I had time to reflect on whether I wanted to take this running lark seriously, and I decided that yes, I did. I got back from Holiday and took myself off to Sweatshop and got kitted out with running shoes and a sturdy support bra. 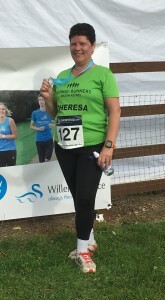 That was it, on the 6 April 2015 I became a ‘runner’ I gave myself a goal and signed up to the St Albans Half Marathon 5K that was taking place on 14 June 2015. Steve was running in this and I knew Justin was thinking about doing it, I just had to make sure he did. I never told him what I was doing so all my training had to be done in secret and the occasions where we ‘crossed’ on the doorstep I had to pretend to be going to Zumba, or a brisk walk. I’d seen people running around Milton Keynes in green tops with Redway Runners across the front, but hadn’t really taken much notice of them. I thought they were an elitist running club and not to be approached by the likes of me. How wrong was I. Jason had found out that they were starting a beginner’s course, so a few weeks before the St Albans event we joined, and it was the best thing I could have done. The club were so welcoming and encouraged everyone to take things at their own pace. Glen’s Beginners Course ran for 10 weeks and taught me how to warm up / warm down, and what I should be doing to make it work for me. At the end of the 10 weeks was a graduation 5K parkrun, eek! My first training session 5K was on 7 June 2015 and I did that in 51 minutes. Meanwhile, my secret training was paying off and the day had come to go to St Albans and put into practice everything I had been training myself for. Justin still had no idea what I was doing until the morning of the event. I couldn’t sleep the night before due to excitement and nerves all rolled into one. I was up and getting ready before he had surfaced and when he did, he asked me what I was doing up so early on a Sunday morning, I then had to tell him that ‘some of us have a run to do today’ The look on his face was priceless. Off we trundled in the car down the M1 and by this time more and more people were becoming aware of what I was going to do. Messages of encouragement and good luck were pouring through by text and Facebook, I felt really chuffed with myself that I’d managed to keep the secret for so long. Arrived at the event and it was raining, but I didn’t care, I was here to do my best. I’d set myself a target of 50 minutes, I completed the 5K in 45:50, result! Af ter St Albans, I threw myself into the Redway Runners beginners course working towards the graduation parkrun on 25 July 2015. Over the weeks I was getting stronger and a bit faster session by session. Graduation day arrived and I paired up with my run buddie and off we went. Half way round, and Justin came back to run with me once he’d finished his parkrun. Between the three of us I managed a finish time of 43:03. I became a fully-fledged member of Redway Runners and I carried on with parkrun, even finding one in Eastleigh when I went to see a friend for the weekend. I have now done 18 parkruns and managed to get six PB’s, my best being 38:49. I invested in some EVB shorts which I saw advertised in Women’s Running magazine – yes, I’ve even gone as far as to become a subscriber – and they support your core as well as hold everything in place! I wouldn’t be without them. The magazine is brilliant, full of tips and inspiration, it’s become my Bible. I went on Holiday in October 2015 to Antigua and took my running gear with me. I managed to do some training up and down the beach at 7am before the sun was too hot. November 2015 saw me take part in the Milton Keynes 5K MoRun with a finish time of 39:59. I hurt my back just before New Year so put myself out for about seven weeks. Got back in time to start training for the 6 March 2016 Milton Keynes Festival of Running 5K which I have just taken part in with a time of 38:57. So far, I have managed to knock about 13 minutes of my 5K run time from that first attempt in June 2015. I have more 5K runs lined up this year but want to progress onto 10K’s. I said I’d give myself a year of 5K’s then start to go a bit further. I’ve tentatively said I will be ready to sign up for my first 10K at the Milton Keynes event in March 2017, I don’t like to rush things. Who’d have thought a year ago I would be where I am now, I certainly didn’t. Anyone that says to me ‘I don’t know how you do it, I couldn’t’ I tell them to start with the Couch to 5K programme and find a good running club. If I can do it, anyone can. Once I’d taken the steps to do this for myself, Justin has given me some great support and encouragement. He’s been there when I’ve felt I can’t do it, he’s run with me to push me to get PB’s and we spur each other on now. He is my inspiration to do better each time. 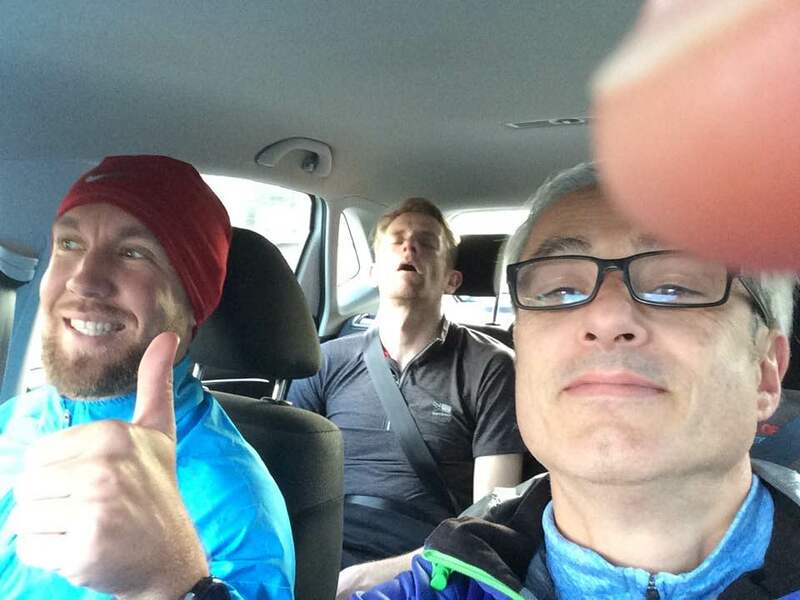 The support from Glen and the Redway Runners has been phenomenal. It’s just one big happy family with no egos to get in the way, we all want the same thing and that is to keep fit and stay healthy. Jason gave up after we’d run St Albans but still supports and encourages me to be better. Steve just keeps going and he has made me a medal hanger which holds 20 medals, I have 3 at the moment so a long way to go to fill it up. I love my running life, I just wish I’d found it sooner. After the 2016 Milton Keynes Festival of Running, I met another Redway Runner (Di) who seemed to be about the same pace as me. We started to do parkruns together and became Runbud’s. Di wanted to step up to 10K as well so we decided to start training and signed up to do the Bournemouth 10K in the October of 2016. 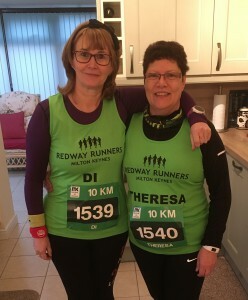 We were both nervous on the day but we had great support from fellow Redway Runners, who we now know as ‘The Green Army’ The weather was great, the sun was shining but not too warm and then we were off. We stuck together as much as we could and really enjoyed the run. Based on my average parkrun time I was aiming for a finish time of 1hr 20mins, I managed 1hr 15mins! I was over the moon and so was Di as we crossed the finish line together. Since t hen I’ve completed another 5K MoRun and knocked just over 2 minutes off my previous time. I’ve done 2 MK Rocket 5K’s with a PB of 34:32 and Women’s Running 5K in 2016. So far this year I have completed the Milton Keynes Festival of Running 10K, numerous virtual runs with Virtual Runner, Women’s’ Running 10K, with Cosford Spitfire 10K with my brother and Bournemouth 10K with Di again to come, hoping we can beat last years time. Justin is still running with Redway Runners and we usually meet up at the club runs on a Monday. Jason ran the Milton Keynes Half Marathon this year and Steve completed the London Marathon. 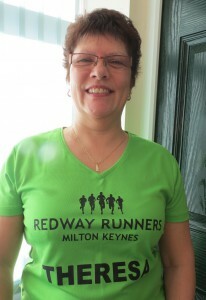 I’ve helped out at new beginners courses run by Redway Runners and buddied runners at their graduation parkrun, as well as marshalled parkrun, Silverstone Half and Milton Keynes Marathon weekend. I get just as much satisfaction helping someone else achieve their goal as I do achieving my own. Redway Runners set up their own virtual run over Christmas 2016 which they called the 12K’s of Christmas, I completed mine by running Christmas Eve parkrun, Christmas Day parkrun and I even made Jason run the last 2K with me on Boxing Day before I went to a friend’s wedding! I’ve suffered with a bad back for so many years, which was my excuse for not running, but apart from the seven weeks break I had because I was being lazy over Christmas and New Year, I’ve had no problems since. This year I completed my 50th park run and turned 60 so I had a 50/60 run to celebrate, with cake of course, and spent the morning with my running family. I now have 11 parkrun PB’s and my best stands at 36:45 which is 15 minutes quicker than my first 5K on 7 June 2015. It might not sound a lot but I’m proud of what I have achieved. So far I have encouraged 2 of my friends to start with the beginners course and my Husband (Eric) will be joining the course starting in September. 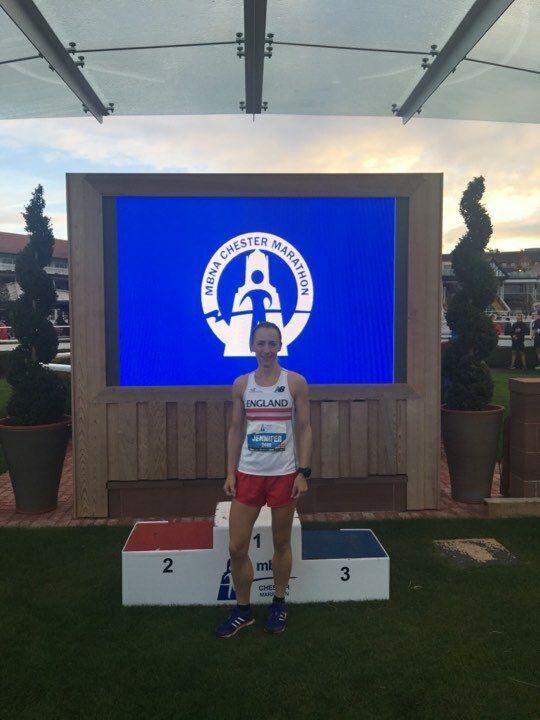 I don’t profess to be the best or the fastest and I will increase to half marathon distance eventually, but if my story inspires anyone else to get off the sofa and start running that’s a job well done! What started as a bit of a laugh to prove a point, has now turned into a way of life I don’t want to give up.